Beverly Cleary turned 100 this year, which gave me reason to revisit her canon one dreary Saturday in March, the kind of afternoon she captured so well. The snow had given way to slush and the sky spat icy raindrops, holding me hostage inside with my three bickering, winter-weary daughters. As the day stretched before me, grey and unstructured, I saw why so many parents over-schedule their kids: to avoid moments like these. With no piano lesson or soccer match to fill the hours, I turned to Neil Patrick Harris's lively audio recording of Cleary's first book, Henry Huggins. Even my ten-year-old, who had already read the book, was lulled by Cleary's reading of the introduction. The author warmly describes how she began writing children's books, specifically to answer a question a frustrated student once asked her when she worked as a librarian: "Where are the books about kids like us?" Cleary hardly needs my own introduction. Few children's authors have sold as many books (91 million and counting) or been awarded on a national level as much as Cleary. Her books are often called "timeless," though I would partially disagree. Many of them, such as her adolescent love stories, Fifteen and The Luckiest Girl, read like dusty relics today. Even Huggins's stale playground sexism (Ramona's sister Beezus is "pretty sensible for a girl" and her cleverness makes him wonder if "girls were good for something after all") leaves me cold at times. But then, sigh, there's Ramona. I'm currently reading the Ramona series for the fourth time. My mother read the books to me as a child, I read them in succession to my two older daughters, and I'm embarking upon them again with my youngest. If you think I'd be sick of them by now, you're right. Though the naughty preschool Ramona always entertains, there are nights when I tire of the dismal years that follow. Once when we were halfway through the series, I pleaded with my middle daughter to take a break so that we could read a fantasy story, possibly one of her fairy books? I longed for a world outside the Quimby living room. She refused, maybe because mundanity is what makes the Ramona stories so relatable to children. Ramona is nothing if not real. That realism is what won the fourth book in the series, Ramona and Her Father, a Newbery Medal. Released in the midst of the bleak economic climate of 1977, the book begins with Mr. Quimby's announcement that he has been laid off from his job at a storage company and given only two weeks' salary. Ramona's plans to eat a hamburger and fries at the Whopperburger are dashed as her mother shuffles to the stove to warm up cold creamed cauliflower. It's characteristic of Cleary, a keen observer of domestic life, to set the tone of the book with a passage about dinner. Throughout the series, the meals that appear on the Quimby table signify the broader circumstances of their family life. As their finances grow dire, Mrs. Quimby's efforts to feed her family become painstakingly frugal. She serves pumpkin pie for a week to salvage a jack-o-lantern that their cat ate, because it "cost a lot at the market . . . a couple of dollars, at least." Another time she sneaks sale-priced beef tongue onto the dinner plates, to Ramona's disgust. Food also represents the family's emotional nourishment, or lack thereof. One particularly frustrating day soon after her mother goes back to work full-time, the family arrives home late anticipating stew for dinner. The slow cooker "always gave out a warm and welcoming fragrance, as if [her] mother had been home all day preparing supper to greet them," Ramona muses. But her domestic reverie is broken (along with every parent's heart) when her mother realizes she forgot to plug in the slow cooker. Where could her father be? . . . Her insides tightened with fear. Maybe her father was angry with her. Maybe he had gone away because she tried to make him stop smoking. She thought she was saving his life, but maybe she was being mean to him. Her mother said she must not annoy her father, because he was worried about being out of work. Maybe she had made him so angry he did not love her anymore. She thought of all the scary things she'd seen on television—houses that had fallen down in earthquakes, people shooting people, big hairy men on motorcycles—and knew she needed her father to keep her safe. The adults in Ramona's world hold tremendous sway over her emotional life. She obsesses over grown-ups' slights and negativity, from the teachers who find her annoying to her neighbor's dull grandmother, who grudgingly watches her after school when Mrs. Quimby goes back to work. She agonizes daily over things real and imagined: her parents' bickering, her father's unrealized dreams as an artist, her mother's news that she's pregnant with a baby whom Ramona worries will consume her mother's love and attention. It often pains me, reading Ramona to my daughters, because I don't want to believe that my own stalled ambitions and daily grievances affect them so. But, as Cleary reminds us in the introduction to Henry Huggins, she didn't write her books for adults. She wrote them for "kids like us," the sensitive subjects of adults' imperfect regimes. Perhaps Cleary's attention to childhood's neuroses is partly why my daughter preferred it to the fairy book. The author normalizes domestic minutia in a way I rarely see in modern mainstream children's literature. In Cleary's world, cars break down, milk prices go up, and banks delay loans. These seemingly mundane, "adult" occurrences are the atoms that make up families' lives. Cleary knows that children notice and wonder about them. She doesn't brush these everyday details aside in order to get on with the plot; they are the plot. Contrast the Ramona series to its closest modern-day literary equivalent, the Clementine series by Sara Pennypacker. Clementine, like Ramona, wears overalls, is somewhat gender fluid, and, as a friend of mine once put it, "has a lot of undiagnosed issues." (It's implied that she has ADHD; I suspect Ramona's condition might be anxiety.) Clementine is forever in third grade, with the same kind, progressive teacher in each book. He supports her short attention span and never misses a chance to boost her confidence. Occasionally, he sends her to the principal, who is authoritative yet equally understanding. Once, Clementine butts heads with a substitute teacher, but they discuss the problem and find a solution. In Clementine's world, the grown-ups are allies, quick to forgive misdeeds. Though Clementine's life is very different from Ramona's, I suspect that her family's finances are not. Her parents are middle-class: her father is an apartment building supervisor and her mother is an artist. They live in Boston, yet if they struggle with the high price of city living, they don't let on. It's clear that they aren't rich, but finances don't impact daily life as they do in the Quimby family. Take this scene from Clementine's Letter, where Clementine comes home to find her parents bent over the kitchen table paying bills. "I don't like bill day, because on bill day my parents say No to whatever I ask," she says. But when she does ask if she can go to the store, her mother gives her money to run an errand with an older neighbor friend. Clementine and her pals have an enjoyable outing to the art supply store. The book never mentions bills again. Presumably, the family is able to pay them and have enough left over for an arbitrary dinner out at "the fanciest restaurant in Boston," the Ritz-Carlton, where the book concludes. I'd guess beef tongue is not on the menu. The narrative pacing in the two series widely differs as well. Where the Clementine books bounce jauntily along, reading the later Ramona books can feel like slogging through the incessant Oregon rain in Ramona's too-small galoshes. The Quimbys don't spend their downtime having madcap city adventures. They heat up leftovers, run boring errands, and bicker when they're stuck inside, just like most families (including mine). In Ramona the Brave, Cleary writes, "Each of [Ramona's] days seemed to plod along more slowly than the day before. . . . Number combinations. Reading circles. Bologna sandwiches and chocolate chip cookies from the store in her lunch three times a week." Anyone who's been a child likely remembers that feeling—how childhood, for all its joy and wonder, could also be a dull routine, a holding pattern, a humdrum waiting game with an elusive goal. In the Clementine books, the family's goal is clear: happiness. Conflicts introduced in the first chapter are neatly resolved in the last. The Quimbys' conflicts are thornier, their happiness more tenuous and elusive. Take this scene from Ramona and her Father when Ramona catches Mr. Quimby smoking after he'd promised to quit. An argument ensues. After they make up, her father tells her he loves her, and Ramona asks him a startling question: "Then why can't we be a happy family?" Mr. Quimby tells Ramona he has news for her: they are a happy family. Ramona remains skeptical, but her father persists: "'Yes, we are.' Mr. Quimby was positive. 'No family is perfect. Get that idea out of your head. And nobody is perfect either. All we can do is work at it. And we do.'" The notion that happy families need not feel happy all the time, or even most of the time, is a bit revolutionary in a culture that author and political critic Barbara Ehrenreich termed "bright-sided." This idea comforts me in a way I'm beginning to understand on my fourth reading of the Ramona series. As a mother, I'm often plagued with a gnawing hunch that I'm doing it all wrong, though I can't pinpoint how. My identity feels divided between the Clementine family that I show the world on social media ("Dinner at the Ritz!") and my real, daily Quimby family, the one plodding through homework, errands, and domestic chores. When I review my family life as a whole, the waters clear. I see a household of people who deeply love one another despite daily setbacks and disagreements. But moment to moment, I struggle to reconcile this transcendent truth with the one immediately before me: a five-year-old who hates the dinner I've prepared, a husband who hates a work project, a tween who hates everything. When I revisit Ramona, these truths feel more harmonious. Still, I can't help occasionally longing for the kind of Hollywood ending that abounds in Clementine. Specifically, the first time I read the Ramona series to my own child, I was shocked that Mr. Quimby fails to find a suitable teaching job after earning his degree in art education. Defeated, he accepts a job managing the supermarket where he has unhappily worked as a checker ("We can't always do what we want in life," he explains to Ramona). 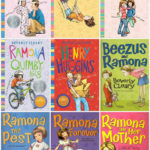 I read the series through the final book, Ramona's World, anxious for his situation to improve, with no luck. A part of me was angry with Beverly Cleary. Shouldn't we be teaching our kids that hard work and education pay off? I wondered. But therein lies the brilliance of the Ramona series: it reflects the fact that sometimes, the only resolution in life comes from within. I have to believe that Mr. Quimby's stagnant career was a conscious choice Cleary made, a way for her to challenge our very American notions of upward mobility and idealism. Cleary reminds us that sometimes we don't find our lost cat or like our teacher or get the job, and there's nothing to be done about it except to keep on keeping on. Our modern culture is often too fearful to explore this territory with young children; instead, we ply them with platitudes, telling them to reach for the stars and anything will be possible. If they don't stick out an endeavor, they're scolded for lacking grit. But what if, like Mr. Quimby, they do stick it out and fail? After all, today's economy might not be saddled with the crippling unemployment and inflation that provided the backdrop of 1977's Ramona and Her Father, but modern children are heirs to a widening economic rift that is arguably just as unnerving. Perhaps we all could use a dose of Ramona's timeless realism, now as much as ever. At the end of Ramona Quimby, Age 8, Ramona finally gets her Whopperburger, and the reader gets the closest thing to a happy ending Cleary offers. A friendly stranger picks up the tab for the Quimby family, prompting Beezus to observe, "This day had a happy ending." Ramona corrects her. "A happy ending for today," she says. "Tomorrow," writes Cleary, "they would begin all over again." As do we all.